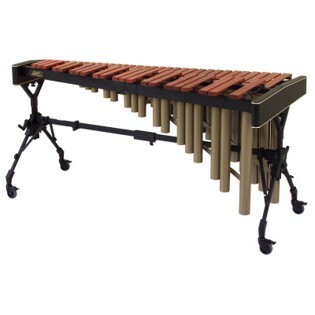 The Adams MSPV43 Padouk Wood Bar 4.3 Octave Marimba delivers a full-size marimba for home or school use at an affordable price. This Adams 4.3 Octave Marimba features graduated Padouk wood bars that are only slightly narrower than the Concert Series synthetic or Rosewood models (3/10 of an inch in the lowest octave only) and offer the same precise tuning to the 6th overtone and voicing as all of the Adams instruments including the Artist Marimbas. Padouk wood bars offer an excellent alternative to Rosewood, by producing a beautifully warm, woody sound, at a fraction of the Rosewood’s cost. The bars are tuned through the sixth overtone, which offers complete control over all aspects of the marimba sound. Precise tuning and voicing provide for balanced sound through the entire range of the instrument. Included with the purchase of this (and any Adams keyboard instrument) is a free bar tuning within the first year of ownership. Simply arrange with Steve Weiss Music to have the bars sent back for retuning within the first year you own your instrument (normal “down” time is approx 2-3 weeks). The Adams MSPV43 resonators are welded for strength and noise free dependability and are finished with a durable powder coated finish. Both the rails and resonators fold in half, allowing these instruments to easily fit in the trunk of almost any car. The Adams patented Voyager Frame System is extremely durable and offers effortless adjustment to a wide range of playing heights. Marimba cover and mallets are included. This marimba is just what my son needed for home practice. It is a nice quality instrument and at a budget friendly price point. Super happy with the purchase. This is exactly what we wanted/expected. This is a perfect marimba to use both in the home and professionally at concerts. The bars are not as graduated as more standard sized 4.3 marimbas, however that has not been an issue for me. The frame is solid and easily height adjustable. I have enjoyed touring with this instrument and will continue to use it as my marimba of choice. It's so hard for mallet players to practice at home, but the affordability of this instrument made it possible for us. It has a great sound, was easy to assemble and has been invaluable for my daughter's development as a player. This is the second Adams marimba I have purchased. The quality has been consistent - good tuning, easy assembly (good directions), plus Adams has improved the casters. The casters are larger than the predecessor. I had a great experience dealing with Steve Weiss. It was easy to purchase and the equipment arrived on time and in perfect shape.